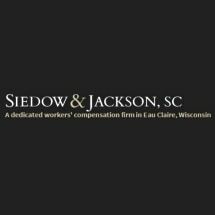 Siedow & Jackson, SC, has been serving injured workers and their families in west-central Wisconsin for more than 30 years. In the Eau Claire area, it has handled more workers' compensation cases than any other firm. Before they opened their practice, both Tom Siedow and Steve Jackson were state worker’s compensation judges. Both attorneys at the firm have the advantage of having worked the law from both perspectives, giving them an excellent understanding of how to effectively represent injured workers. Siedow & Jackson's offices are conveniently located near the Oakwood Mall on the west side of Highway 53. Office hours are 8:30 a.m. to 4:30 p.m.